Luke Tobias Joeckel (/ˈdʒoʊkəl/; born November 6, 1991) is an American football guard for the Jacksonville Jaguars of the National Football League (NFL). He was drafted by the Jaguars second overall in the 2013 NFL Draft. 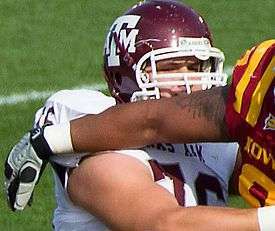 He played college football at Texas A&M, starting all 37 games at left tackle from 2010–2012. In his final year of 2012, he won the Outland Trophy, awarded to the nation's top college football interior lineman, and was named a consensus All-American. A native of Arlington, Texas, Joeckel attended Arlington High School, where he was an All-State offensive lineman as a senior in 2009. He anchored an offensive line that averaged just under 475 yards per game. His twin brother Matt Joeckel played quarterback for Arlington. His older brother David played offensive lineman at DePauw. Joeckel's father, David, now a trial lawyer in Fort Worth, was a four-year letterman and three-year starter as an offensive lineman at Texas Tech (teammates with Joe Walter), under coaches Rex Dockery and Jerry Moore, 1979–1982. And his grandfather, Reece Washington, played tight end for Texas Tech. Joeckel attended Texas A&M University, where he played for the Texas A&M Aggies football team from 2010 to 2012. He enrolled in January 2010, and went through the Aggies spring drills. As a true freshman in 2010, Joeckel started all 13 games at left tackle. The Aggies averaged over 165.8 rushing yards per game and featured a 100-yard rusher in nine games, six of which belong to Cyrus Gray. Joeckel earned Freshman All-American honors by the Football Writers Association of America and Scout.com. As a sophomore in 2011, Joeckel started all 13 games again and was a second team All-Big 12 selection. He was part of an Aggies offensive front that allowed just nine sacks in 13 games, and allowed Ryan Tannehill to set school records for total (490.2 yards per game), passing (291.1 yards) and scoring (39.1 points) offense. In his junior year, Joeckel started all 13 games at left tackle, protecting freshman quarterback Johnny Manziel's blind side as he went on to pass for 3,706 yards over the season, earning him Heisman, Manning, and O'Brien honors. Joeckel himself was recognized as a unanimous All-American selection. NFL scouts praised his performance against Louisiana State's talented defensive line, in which Joeckel matched-up well against defensive end Sam Montgomery. “I think he is better than Joe Thomas and Matt Kalil,” one NFL GM said according to Pro Football Weekly. Joeckel played alongside Jake Matthews, who played right tackle from 2010–2012. When Joeckel left Texas A&M, Matthews switched to left tackle in 2013. In September 2013, an NFL.com writer asked five NFL executives who's the better player. Three of the five executives said Joeckel. By midseason, Joeckel was projected as a top-10 selection in the 2013 NFL Draft by Sports Illustrated. Ranking him No. 1 on their "Big Board", CBS Sports projects Joeckel as the first offensive tackle to be selected with the first overall draft pick since Jake Long in 2008. On January 8, 2013, Joeckel announced his decision to forgo his final year of eligibility. According to CBS Sports, Joeckel lacks the "natural tools" of 2012 No. 4 pick Matt Kalil, but "is considered the more polished lineman out of the college ranks." NFL.com analysts Gil Brandt, Brian Billick, Scott Pioli, and Charles Davis predicted that Joeckel would be the No. 1 pick. In late January, Sports Illustrated also projected Joeckel to be the No. 1 selection. After the combine, Sports Illustrated still projected Joeckel to be the first player selected overall. In March 2013, Pat Kirwan of CBSSports.com, projected Joeckel to be selected fourth overall, by the Philadelphia Eagles. A week before the draft, the Chiefs were believed to take an offensive tackle at No. 1, after having traded for quarterback Alex Smith. Their decision reportedly came down to Joeckel and Eric Fisher. The Chiefs selected Fisher, allowing Joeckel to fall to the Jaguars, who selected him second overall. Joeckel stated that his immediate reaction to not being selected first overall was "not the most pleasant thing ever," though added that he has used it as motivation. Joeckel became the first Aggie offensive lineman selected in the first round since Richmond Webb in 1990. Despite playing at left tackle during his college years, Joeckel began his professional career at right tackle. Joeckel signed a four year contract with the Jaguars on June 22, 2013 that included a $13.8 million signing bonus and was worth approximately $21 million. After the Jaguars traded left tackle Eugene Monroe to the Baltimore Ravens on October 1, 2013, Joeckel returned to his natural position on the left side. Joeckel's rookie season became short-lived as he played in only five games as he sustained an ankle injury the next Sunday against the St. Louis Rams, when Rams defensive tackle Kendall Langford rolled up Joeckel’s leg. Later that day it was announced he would miss the remainder of the season. He was placed on injured reserve on October 8. Joeckel entered his second season having recovered from the injury during his rookie season. Pro Football Focus viewed him as one of the worst offensive tackles in the NFL in 2014 and held him responsible for eight quarterback sacks. In 2014, Joeckel started all 16 games at left tackle. In 2015, Joeckel started 14 games at left tackle. On May 2, 2016, it was announced that the Jacksonville Jaguars would not pick up the fifth-year option on Joeckel's contract. On August 30, 2016, Jacksonville Jaguars coach Gus Bradley announced that Joeckel would switch to left guard while the newly acquired free agent Kelvin Beachum took over at left tackle. ↑ The German surname Jöckel/Joeckel is actually pronounced [ˈjœkl̩]. ↑ "CBS NFL Draft Scout". Cbssports.com. Retrieved 2013-11-19. ↑ Rang, Rob. "NFL Draft Scout Big Board". Cbssports.com. Retrieved 2013-11-19. ↑ "Michigan's Taylor Lewan paces top college offensive linemen". Nfl.com. Retrieved 2013-11-19. ↑ Lenghi, Mola (2013-01-05). "Arlington Twins Play in Cotton Bowl". Nbcdfw.com. Retrieved 2013-11-19. ↑ "Brother of David Joeckel '10 in Running for Outland Trophy". Depauw.edu. Retrieved 2013-11-19. 1 2 Burch, Jimmy (2012-12-05). "Former Arlington High tackle Luke Joeckel builds on family legacy of blockers". Star-telegram.com. Retrieved 2013-11-19. ↑ "Rivals.com offensive tackles 2010". Rivals.yahoo.com. Retrieved 2013-11-19. ↑ Sabin, Rainer (April 17, 2010). "Joeckel brothers, stars at Arlington, get a head start at Texas A&M". Dallas Morning News. ↑ "FWAA > News > Freshman All-America Team". Sportswriters.net. 2011-01-10. Retrieved 2013-11-19. ↑ "Scout.com: 2010 CFN All-Freshman Team". Cfn.scout.com. 2010-12-14. Retrieved 2013-11-19. ↑ "2011 Football All-Big 12 Awards Announced". Big12sports.com. Retrieved 2013-11-19. ↑ Nawrocki, Nolan (October 21, 2012). "OLT Joeckel rises to big challenge vs. LSU". Pro Football Weekly. ↑ "Ask 5: Who's better, Luke Joeckel or Jake Matthews?". ↑ "2013 NFL Draft - Barkevious Mingo, Bjoern Werner, Star Lotulelei in top 50 - Tony Pauline - SI.com". Sportsillustrated.cnn.com. 2012-11-08. Retrieved 2013-11-19. ↑ Rang, Rob. "Big Board: Linemen rule the board as the big bowl games await - NFL, NFLDRAFT - CBSSports.com - NFLDraftScout.com". CBSSports.com. Retrieved 2013-11-19. ↑ "Joeckel Declares for NFL Draft". Aggieathletics.com. Retrieved 2013-11-19. ↑ "NFL Mock Draft Central". National Football League. Retrieved February 28, 2013. ↑ "*Luke Joeckel | Texas A&M, OT : 2013 NFL Draft Scout Player Profile". Nfldraftscout.com. 2006-09-21. Retrieved 2013-11-19. ↑ Banks, Don (February 27, 2013). "2013 NFL Mock Draft 2.0". SI.com. ↑ Kirwan, Pat (March 5, 2013). "Mock draft No. 2: Chiefs' moves open door for Milliner to go No. 1". CBSSports.com. 1 2 "Chiefs likely to take a tackle with first pick". Kansas City Star. April 16, 2013. ↑ "Report: 49ers agree to trade Alex Smith to the Chiefs". Yahoo! Sports. February 27, 2013. ↑ Wesseling, Chris (April 25, 2013). "Luke Joeckel to Jacksonville Jaguars in 2013 NFL Draft". National Football League. Retrieved April 25, 2013. ↑ "Luke Joeckel: Falling to No. 2 overall "not the most pleasant thing ever" | ProFootballTalk". Profootballtalk.nbcsports.com. 2013-06-20. Retrieved 2013-11-19. ↑ "Luke Joeckel should drastically improve Jaguars offensive line". Big Cat Country. Retrieved 2013-11-19. ↑ Stellino, Vito (June 22, 2013). "Luke Joeckel, Jaguars agree to terms". Jacksonville.com. Retrieved July 18, 2013. ↑ Brady, James (October 1, 2013). "Eugene Monroe trade: Luke Joeckel to take over at left tackle for Jaguars". sbnation.com. Retrieved October 1, 2013. ↑ "Jacksonville Jaguars still believe in Luke Joeckel". NFL.com. June 12, 2015. ↑ "Source: Jags decline to pick up Joeckel's option". ESPN.com. Retrieved 2016-05-02. ↑ Gantt, Darin (August 30, 2016). "Jaguars to start Kelvin Beachum at tackle, Luke Joeckel at left guard". ProFootballTalk.NBCSports.com. ↑ Smith, Michael David. "Jaguars place Luke Joeckel on injured reserve". Wikimedia Commons has media related to Luke Joeckel.